As seen in other industries, a business model called “shared services” brings businesses together to benefit from lower costs from economies of scale in business functions. In order to survive in a fragile industry and an uncertain economy, early care and education organizations must work together in a collaborative way. 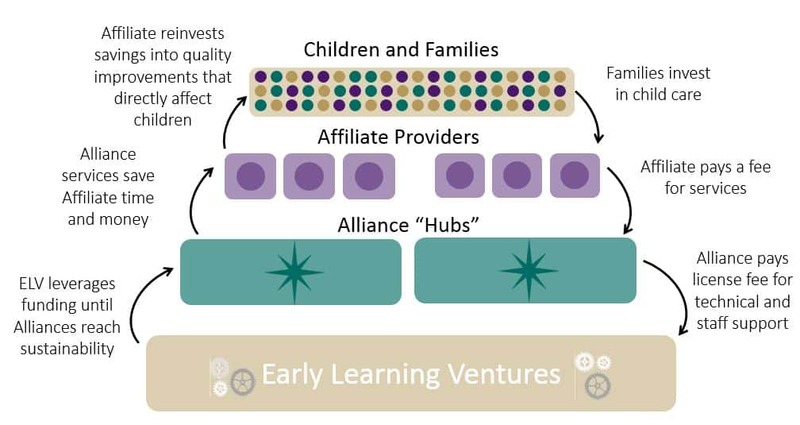 Early Learning Ventures (ELV) is an innovative shared services model for the child care industry that lowers costs, reduces administrative burden, and gives providers more time and money to do what they do best—educating and nurturing our youngest kids. The ELV technology platform provides a comprehensive, fully integrated bridge between small, market-based child care providers and the often siloed child care regulatory, quality improvement, and subsidy systems. What Does this Mean for Child Care Providers? ELV Affiliates obtain lower costs in business functions like purchasing, classroom resources, program administration, human resources, marketing, and online training that meets current child care licensing requirements, as well as a child management system. This web-based system creates accurate and professional records and reports, while helping to streamline and increase efficiencies of management for licensing compliance, the Child and Adult Care Food Program, and child care subsidy programs including the Colorado Child Care Assistance Program. As a result, early child care providers are better equipped to offer high-quality care utilizing this time and money savings. This, in turn, allows them to focus on the most important part of their day – caring for and educating children.